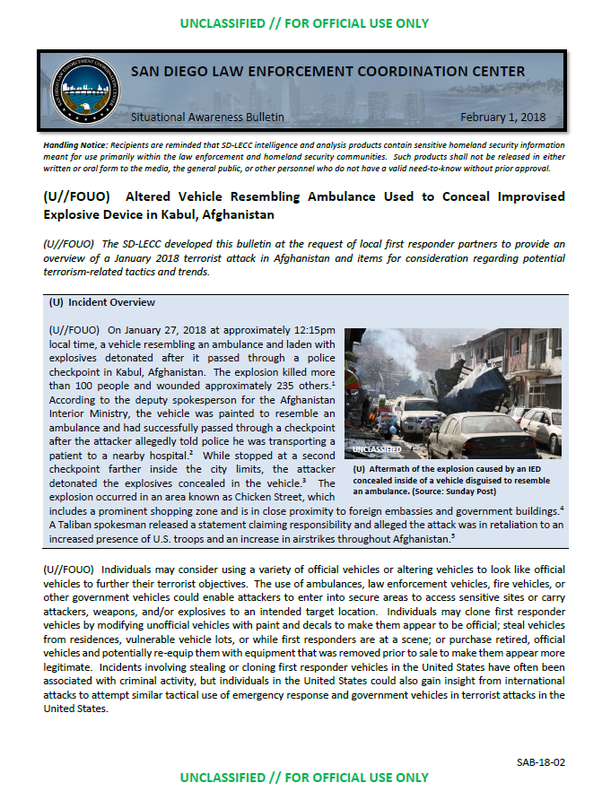 (U//FOUO) On January 27, 2018 at approximately 12:15pm local time, a vehicle resembling an ambulance and laden with explosives detonated after it passed through a police checkpoint in Kabul, Afghanistan. The explosion killed more than 100 people and wounded approximately 235 others. According to the deputy spokesperson for the Afghanistan Interior Ministry, the vehicle was painted to resemble an ambulance and had successfully passed through a checkpoint after the attacker allegedly told police he was transporting a patient to a nearby hospital. While stopped at a second checkpoint farther inside the city limits, the attacker detonated the explosives concealed in the vehicle. The explosion occurred in an area known as Chicken Street, which includes a prominent shopping zone and is in close proximity to foreign embassies and government buildings. A Taliban spokesman released a statement claiming responsibility and alleged the attack was in retaliation to an increased presence of U.S. troops and an increase in airstrikes throughout Afghanistan.